Preparations for winter should begin immediately after the honey harvest. Treat your bees and feed them as soon as possible or they might not be there to greet you come spring. After the very cold July and August this year (2015) and the almost total failure of the main crop (blackberry Rubus fruticosus and white clover Trifolium repens) the bees were very light at the honey harvest with almost all of their stores in the supers and next to nothing below! As soon as the honey is off – you can think about treating for Varroa but that subject deserves a post of its own. It is vital to always check how much stores the bees have in the brood box when you take off the supers and best to feed them immediately. Not only does it gee them up wonderfully but it helps you with that horrible guilty feeling you get when you take their honey away. You just never know what is round the corner and when you will next get the chance to feed them. You could break your arm like I did once. Fortunately I had someone to feed and treat my bees for me. In Autumn feed a strong syrup – 2lbs sugar : 1pint water or 2kgs : 1litre. Heat the water or you’ll be stirring for ever. Make sure all the sugar is completely dissolved or it might granulate in your feeder. Alternatively use a special bee feed. These are more expensive than sugar but they have advantages which make them worth it. They are very strong syrups and use inverted sugars which are easier for the bees to digest. And of course you are spared all that heating and stirring. If you feed the bees sugar, aka sucrose, the first thing they do is manufacture and add the enzyme invertase which inverts the sucrose molecules to fructose and glucose. Ambrosia and Apiinvert are syrups of fructose and glucose so that first step towards storage is done for them. It is also a very strong syrup – 70% fructose/glucose and only 30% water. If you think about it they only need to remove one third of the water content – 10% of the bulk – to store it. And just think of all that stirring you don’t have to do. … I bet I could get it to ferment – a nice champagne yeast, a scatter of dried elderflowers and yeast nutrient and bob’s your uncle. Whatever type of syrup you are feeding, use a rapid feeder – Ashforth or Miller type for Autumn feeding. 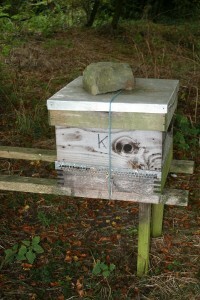 These feeders provide a great long trough allowing hundreds of bees to come up after the feed and take it down rapidly. Hence the name. ‘Rapid’ that is. Contact feeders – the bucket type with the circle of gauze or the home made ones with pinpricks – are slower and less suitable for winter feeding. They are designed for spring feeding where a slow drip feed of a light syrup can mimic a nectar flow and stimulate the queen into lay. Contact feeders also work less well with a heavy syrup and a smaller number of bees are able to drink at one time. If you have made a sugar syrup it can granulate on the gauze. Of course if you’ve nothing else – a contact feeder will do but keep an eye on it because the bees tend to propolise the holes up as part of their winter waterproofing regime. Colonies undergoing late supersedure may show a lack of interest in their lovely syrup until their new queen gets going. Bear it in mind before taking feeders away altogether if some seem slow. This year (2015), in some upland parts anyway, the ivy has been a damp squib so even more important to check early that the bees have enough stores to carry them through the winter. October is the last month for the beekeeper to realistically feed the bees up for the winter – weather depending. As the temperatures begin to fall regularly below 15 degrees, the populations of bees dwindle and those that are left spend more of their time clustered so feeding syrup is no longer an option. Eventually a point is reached where it is taxing to ask winter bees to ripen stores – remember these are the bees that have to go through to March – best not to wear them out. Any hives that are still light could be bolstered with some frames of stores from elsewhere. If there is a mid-winter stores crisis – fondant can be applied. A rock on a hive might keep the roof on in a gale but if the stand is toppled the hive will burst asunder and the bees will be exposed to the weather so rope or strap your hives if possible. Even if the hive is knocked off the stand by livestock a rope will keep the boxes together and perhaps save the bees till after you’ve surfaced after christmas. While hives can be happily stood on low stands for the summer it is better if you can, to get them up onto high stands for the winter. Remove tall weeds from around and under the hives to allow a free flow of air – bees do not thrive in damp conditions. Chalkbrood does though! Check for rot in your stands and exchange for sound ones now. Drag the rotten stuff home to dry, ready for repair and wood preservative of your choice. They say a mouse has the ability to uncouple the plates of bone in its skull and flatten its head to pass though holes bigger than the thickness of a pencil! Any entrances thicker than that will need mouseguards. A mouseguard is a strip of metal perforated with bee-sized holes which can be pinned over the entrance to prevent mouse invasions. Mice can destroy a hive of bees in the winter.